September | 2014 | Go Chapel Hill! Lighten Up Chapel Hill & Carrboro Safety Program Launches! Coupons available for those needing lights on the back and/or front of their bicycles in order to comply with new NC Bicycle Safety Law which states that all bicycles traveling in dark conditions needs a white light on the front of the bike and at least a red reflector or a red flasing light on the back of the bicycle. 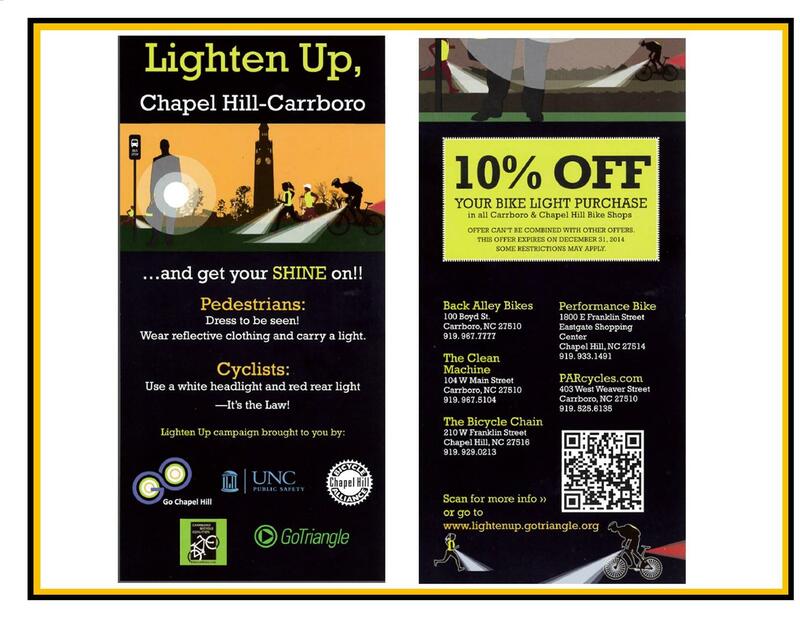 In Chapel Hill and Carrboro ALL bicycle shops are participting in the Lighten Up Chapel Hill – Carrboro safety campaigns. Print this coupon to receive a discount on bicycle lights at ANY of the bike stores in Chapel Hill and Carrboro! Travel Safe and Travel Brightly! GO CHAPEL HILL: Bicycle Benefits Discount Launched! Join the Go Chapel Hill Commute Club– Leave your car at home and bike, bus, walk to work! What: Those joining the smart ride in to work program, Go Chapel Hill Commute Club, receives a Go Chapel Hill Bicycle Benefits Sticker or key lob at no charge. Just show the sticker at ANY participating store in the United States to receive discounts on all sorts of great items/food/fun! How: Join the Go Chapel Hill Commute Club on this website and we will contact you about receiving your own discount sticker and other benefits! Once you receive your sticker place it on your bike helmet and begin using it immediately! Vendors: Participating agencies/vendors/organizations ask that you present you discount sticker BEFORE making your purchase! And as always, new employees might not be aware that their store is a particpating merchant so please be patient with them! Breaking Away Bike-In Movie Night – Try Transit to Get There! Did you know this is TRY TRANIST MONTH!!!? So why not try FREE Chapel Hill Tranist to get to Breaking Away Bike-In Movie Night? WHAT… why ride a bus when a bike will do? BECAUSE, Chapel Hill is known for the severe hills that make cycling a bit difficult at times BUT GUESS WHAT, ALL THE BUSES HAVE BIKE RACKS! 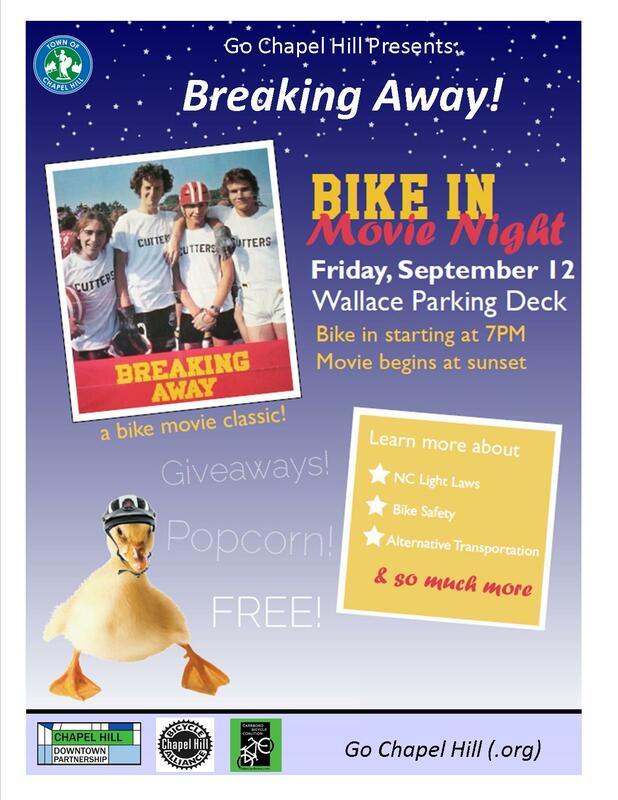 Sooooo, when a hill prevents cycling, put the BIKE ON THE BUS and get anywhere in Chapel Hill INCLUDING to the free movie night on Wallace Deck at 7 pm for the movie classic BREAKING AWAY starring Dennis Quaid! Prizes of $50 Gift Card, Coffee, Hot Popcorn and giveaways all night long. And best of all… VALET PARKING FOR YOUR BICYCLE ONCE YOU ARRIVE!!! Go Chapel Hill!!! Try Transit if you can’t take those hills… And Try Transit the rest of the week too!